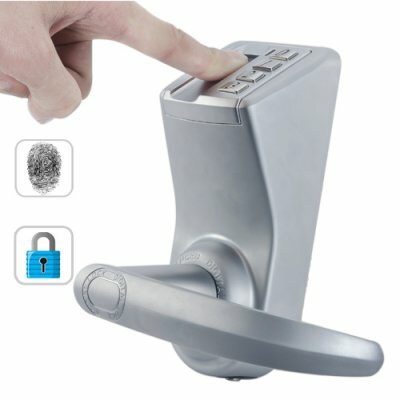 Successfully Added Pledge - Fingerprint Security Door Lock to your Shopping Cart. Introducing the Pledge, an incredible fingerprint door lock which can be summarized in four words: Dependability, simplicity, efficiency and durability. This sturdy little biometric fingerprint security system makes sure your privacy is kept private as you go about your day. The security of your home and office is guaranteed to be intruder-free with this beautiful metal Fingerprint Security Door Entry System. Powerful and Durable: The latest in fingerprint door security is made from an all-metal die casting and complete with a PVD coating for increased durability and prevention against wear and tear. Look to the Pledge for constant protection as the rock solid 3.7kg weight also acts as an essential countermeasure against battering and forced entry. Easy to Use: With the Pledge, you can have a secure and private room only accessible via your personal fingerprint, or you can program up to 120 additional fingerprints for your colleagues / friends / family. Access can also be granted via an 11 digit PIN code and/or 2 backup keys. Additionally, The Pledge comes with a reversible handle, which means increased flexibility and the end to awkward hand movements for your important guests. Easy to Install: The Pledge ignores the hassle of having to deal with cables and computer software as it comes independent and ready to go. DIY (do-it-yourself) installers will also appreciate the compact frame, which is sure to fit on any business or home door. A pre-installed and easily fitted unit means hours saved and minutes away from total protection. This safe and heavy lock is a small price to pay for the safety of yourself, your friends and your family, so why hesitate? Don't wait until something happens before being serious about safety - buy the Pledge today from the leader in wholesale electronics, Chinavasion. Safety: The user can take the handle off the lock (with an Allen key) to reveal the key hole. Efficiency: Power is provided by four AA batteries which can last up to a year due to the Pledge's power-saving system. The batteries are only used when the unit is turned on for fingerprint recognition and will then automatically turn off after a few seconds. The Pledge will also emit a red light to warn you of a low battery. Convenience: You can open the door with the key and you don’t need fingerprints. If the batteries die, you can connect a 9V battery to the bottom of the lock and then use fingerprints to open the door. Accurate and Dependable: 3D optical sensor with a capture angle of 360 degrees. This means a false acceptance rate of less than 0.0001% and a false rejection rate of less than 1%. The handle on both the inside and the outside can be left or right. The user can change this quickly and easily. Comes with instruction manual and diagrams for easy installation. Requirements: Door, 4 AA batteries, installation. Does not require software or computer. Can be used inside or outside. Is not 100% waterproof. To open the door, just tap or touch the sensor with your finger. Other small fingerprint locks use a swipe sensor, which is less accurate. When user installs in a door, the two arrows on the square-shaped lock must be aligned or close to each other. This lock fits in the space of a normal door lock in many Western homes. The user will need to make one more hole in the door for the top bar. This is to keep the lock in the correct position. Press "0" to turn it on. The instruction manual tells you how to register as an administrator, add users, delete users, and open the door. The Pledge looks pretty small... are you sure it won't be broken with a simple kick? It comes layered in a PVD coating for increased durability and density. You, too, will understand the power of the Pledge once it is in your hands. Ive installed my doorlock and it works really good!!! The quality looks and feel good, instructions of how to install and program the device is really hood aswell. Thanks chinavasion for good products and excellend service, hope to reach gold status soon. I can surely use this in my ammunition room. cool got my door lock today took only 30 min to install very easy took me longer to work out the instruction manual not very good english was quite hard to understand but with a little playing around it become easyer this is a cool door lock works very well thanks again. that door lock is a home furture convience, I want one.